Just as creamy as baked cheesecake, but so much easier to make – this creamy, fruity and gorgeous Lavender and Raspberry No Bake Cheesecake has sweet raspberries, creamy and tangy whipped cream that’s scented with lavender syrup and a delicious Oreo cookie crust! I have mixed feelings about summer. While the long, sunny days are always a mood lifter, the heat and humidity, I do not look forward to. Winter on the other hand, I can handle. My argument is that you can put on layers and layers to keep yourself warm in the winter, but you cannot possibly peel off all your clothes and head out in the summer. Well, I suppose you could do that… maybe just that one time. My preferred method of dealing with hot, muggy days however is to have something nice and cold to cool myself down. And if I’m in the mood for a treat, something cold and fruity works like a charm every time. That’s where this beautiful Lavender and Raspberry No Bake Cheesecake comes in handy! 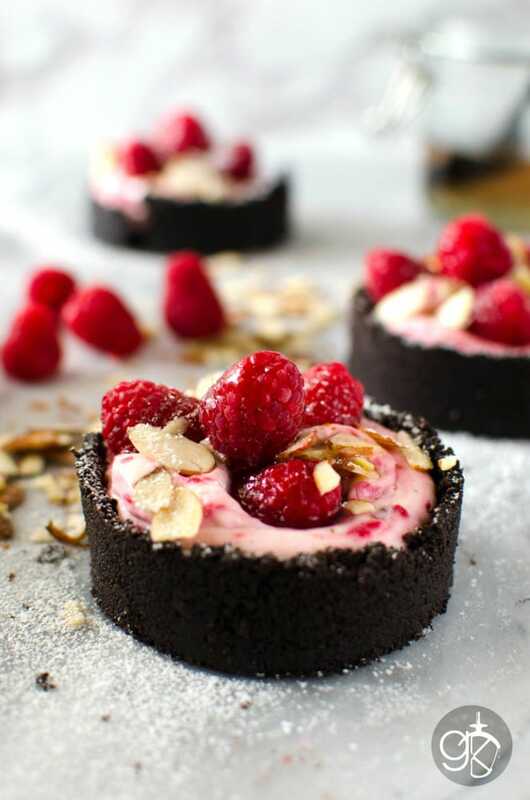 These lavender and raspberry no bake cheesecakes feature sweet raspberries, a creamy and tangy whipped cream cheese (no gelatin) that’s scented with a lavender syrup, all encased in a crust made out of what is arguably everyone’s most favourite cookie in the world – Oreos! 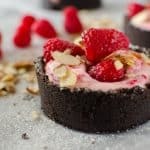 With these no bake cheesecakes, I wanted to create a recipe that would be easy to put together and still taste incredible and also different. I love trying new flavour combos (although lavender and berries are a fairly common pairing) and this combination is one that I’m very fond of. This recipe uses my Lavender Syrup, for which you can get the recipe right here. So you love cheesecake, but don’t want to bake one. What are you going to do? This raspberry no bake cheesecake right here! It’s perfect for this time of year (or anytime of year, really), for kids, for guests and even for parties. It’s delightfully creamy, fruity and the lavender syrup gives it a fantastic lingering floral element that’s hard to replicate with anything else! And it can be put together easily and tastes JUST as creamy as a baked cheesecake. What’s not to love?? 🙂 You can also assemble parts of this raspberry no bake cheesecake ahead of time, and then put it together just before serving. Process the oreos and salt together in a food processor until you get cookie crumbs. Then drizzle the butter in while running the food processor at its lowest setting (this makes the cookie crumbs moist enough to be pressed into a cheesecake base). Butter the insides of 4 egg rings or tart rings. Place these on a parchment paper lined cookie sheet or tray. (Alternatively, you can use 4 mini fluted tart pans as well). Place some of the cookie crumbs inside and press down the crust to form a flat base using a flat bottomed glass, or tart tamper, or the back of a spoon. If you'd like to have a crust riding up the sides of the cheesecake as well, you can use your fingers and press the cookie crumbs onto the sides of your egg rings/tart rings (this is optional - just the base would be sufficient and easier). Freeze the tart bases for a few hours, or until you need them. Carefully remove the tart ring by using a sharp knife to loosen the edges. Be careful not to break the bases. If you have molded the sides of the cheesecake as well, you may need a blow torch to warm up the sides slightly, to make unmolding easier. Place all the ingredients in a small saucepan and bring them to a boil on medium heat. Lower the heat and let it simmer until you have a thick raspberry coulis/paste - takes about 10 minutes. Set aside to cool and store in the fridge until ready to use. Place all the ingredients in a bowl and whisk until you have a smooth paste. Add as much of the raspberry paste/coulis as you need to create a ripple effect. You can change the amount according to your preference. I added about half. Cover with plastic wrap and keep in the fridge until ready. Optional - store the cheesecake in the fridge in a piping bag fitted with a wide round nozzle. 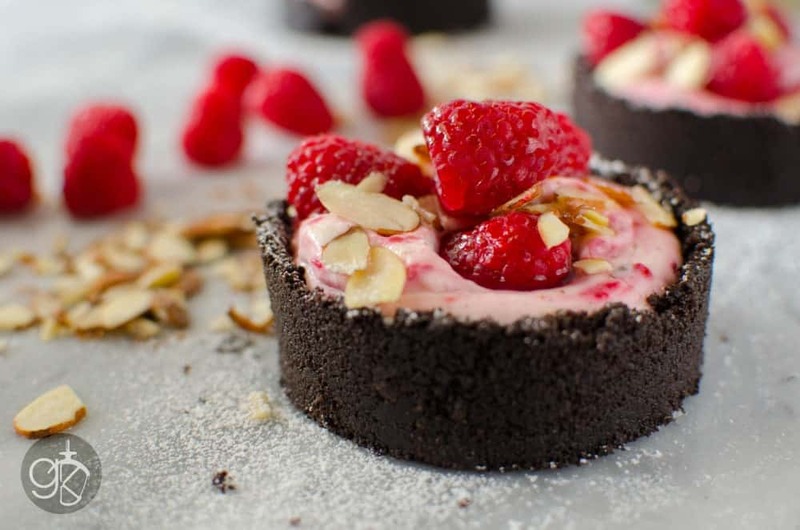 Remove unmolded tart bases from the freezer (about 10 minutes before serving). Spoon or pipe in the cheesecake evenly onto the four bases. Stud the top with 3-4 fresh raspberries. Drizzle a little extra lavender syrup on top. Sprinkle some sliced almonds and confectioner’s sugar. The flavour of oreo cookies pairs really well with the creamy and tangy cheesecake flavour here. 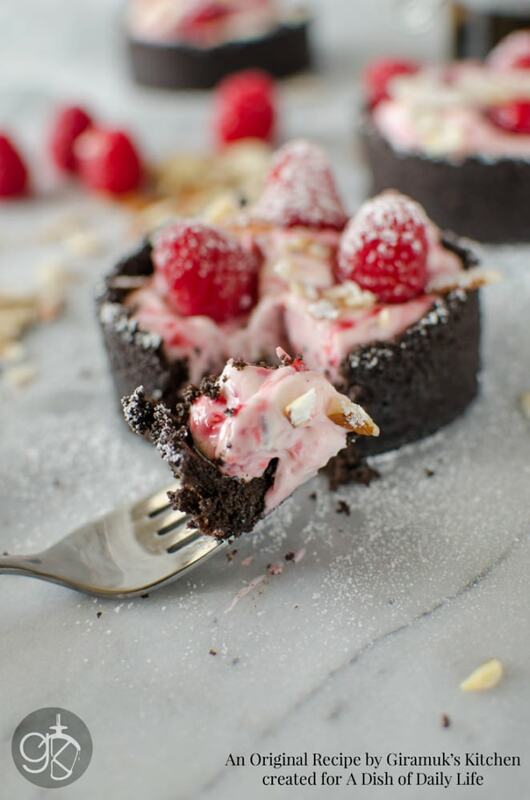 The raspberries add a colourful ripple in addition to that sweet, tart, fruity flavour. And then you’ve got that floral sweetness and fragrance of lavender. However, if can’t be bothered with the lavender syrup – no worries! Simply use normal sugar syrup instead, although I have to say the floral notes in the lavender syrup complement the fruity flavours so well! This lavender and raspberry no bake cheesecake really is an incredible dessert that I’m sure you guys will fall in love with! 🙂 So I hope you try it and let me know what you think of it too! I’ll be back with another great recipe tomorrow, so don’t forget to check back in for that. 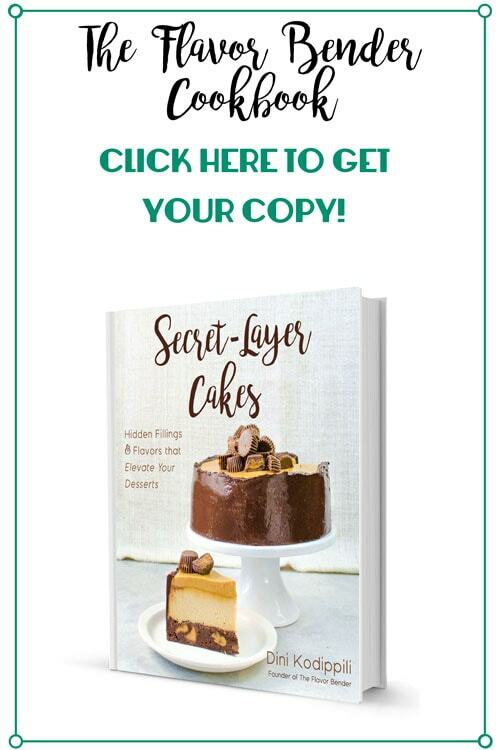 And if you liked this, don’t forget to subscribe for new (and free) recipes and updates by entering your email address on the side bar (and get all these recipes delivered straight to your inbox), so you don’t miss out on a thing. Oh my just beautiful Dini…..love how you made those oreo cups, will def have to give that a try. Oh Dini! Another winner. And love having another way to use your lavender syrup (which is sosoososososo good.) Visitng from #FoodieFriDIY. Love this Dini… And I am MOST DEF A SUMMER GIRL! Give me heat any day over freezing sludge! I do love no bake desserts too, mostly because it means I don’t have to wait too long to enjoy it. hahaha!! Just saw these over on Michelle’s blog and had to come tell you that you officially have a recognisable style! Well, officially by my standards! I saw the photos before I read the post and my first thought was “woah, that looks like something Dini made and photographed!” and then I read the post haha! They look delicious too 🙂 I’m not usually a fan of no bake cheesecake, but whipped cream cheese and no gelatin sounds like the kind of no bake cheesecake I can get behind! That makes me SO HAPPY! 😀 Yaay! Glad I could make you happy 😀 😀 I do love your photos after all! I’m happy you brought this along to Fiesta Friday this week too, this definitely needs to be shared!